For years I have made a great big bowl of cranberry sauce with every holiday turkey, only to watch family and guests (me included) take a polite nibble and leave the rest. The bowl sits in the fridge for a week or two, untouched, before someone puts us out of its misery and tosses it out. Not this year. Adding a little port and cinnamon to traditional cranberry sauce elevates it from a mandatory, but barely touched, condiment to an exotic attraction, equally good with roast pork or on a cheese platter. Canning the sauce means you’ll have a jar to give away or save for Christmas, if you can resist opening it earlier. Bring sugar, water and vinegar to a boil in a medium stainless steel pot over high heat, stirring until sugar dissolves. Add cranberries and return to a boil. Reduce heat and cook, uncovered, at a gentle boil for five minutes, stirring frequently. Add port and stir to combine. Place a cinnamon stick in each jar. Place lids (but not screw bands) in very hot (not boiling) water for a few minutes to soften seal. 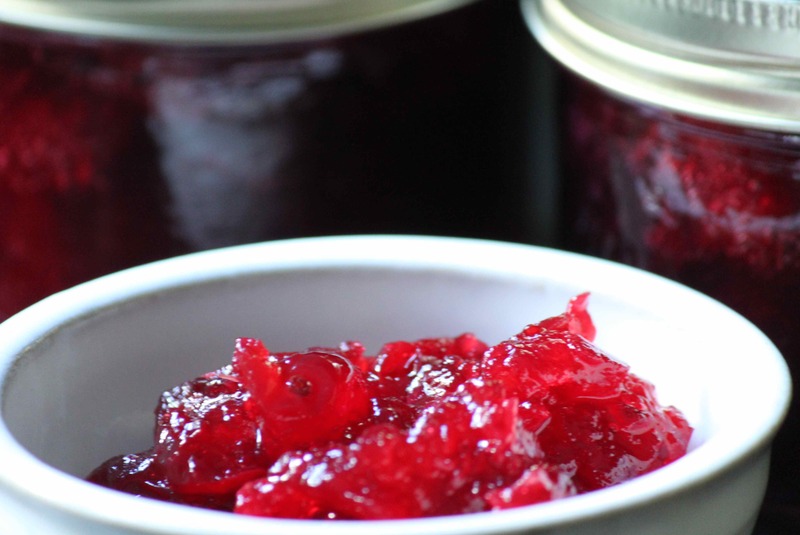 Quickly pour hot cranberry sauce into hot, clean 250 millilitre (1 cup) jars, leaving 1/4 inch headspace. Wipe rim. Center lid on jar. Screw band down until resistance is met, then increase to fingertip-tight. Place jars in canner, ensuring they are completely covered with water. Bring to a boil and process for 15 minutes. Remove jars, cool on the counter for 24 hours, check seal (keep any that haven’t sealed in the fridge and enjoy them over the next couple of months) and store. This entry was posted in Preserves and tagged canning, Christmas, cinnamon, cranberry, port, preserving, sauce, side dish, Thanksgiving, turkey. Bookmark the permalink. I wish I knew about this before today. We are doing the turkey for dinner tonight and I decided to pass on the cranberry that you just push around the plate and throw out in a week or so. Go for it. There’s still time. I hadn’t even purchased cranberries this year and since I felt tethered to the house/kitchen today without much reprieve, I took a full pass. If you read the blog later you will see that I had no real estate left on the dinner plate anyway as we seemed to be a bit nuts on the number of dishes we made this year. Though I think I will make some in the coming week to can as you suggest. Then I am way ready for Christmas. I was thinking of canning in little 125 ml jars or is that just too wee? Sounds like a great meal. I was thinking the smaller jars would be better, but I was all out.